Printer, publisher and stationer, 39 East Street, Chichester. Moore was born in 1843 in Chichester, and in 1874 married Ann Shurman, who had been born in 1849 at Chipstead in Surrey. The 1901 census records that he and Annie had two children living with them: Edith Annie Moore, born in 1875, and Herbert William Moore, a compositor, born in 1876. Moore was in business by 1875 and still active in 1901, printing Chichester Directories, almanacs, memorial cards and similar items, mainly for local circulation. In addition to his shop at 39 East Street, he had a printing works in St John's Street. When he retired is unclear as the business continued to operate under his name long after he was gone. His son, Herbert William Moore, had certainly taken over the printing works by 1918. The Electoral Register for that year records that Herbert and his wife, Florence Madeline Moore, lived at a house on the Birdham Road in Chichester. By 1924 the firm that John William founded had become Moore and Wingham, and it continues today under the name of Moore and Tillyer. By 1909 John William Moore was publishing some rather crudely coloured halftones of Chichester decorated with the city's crest, which were presumably supplied by a specialist printing firm, such as Brown & Rawcliffe of Liverpool who produced cards of very similar design for many cities and towns. A coloured "Greetings from Chichester" real photographic card was on sale by 1911. Of more interest to today's collectors are some collotypes of Chichester, which were printed in Germany, but have Moore's name and address on the front. A multi-view collotype is labelled "J. W. Moore's Copyright" on the back. Moore also published some interesting real photographic cards. A lightly sepa-tinted view of East Street in Chichester sports a facsimile handwritten caption and, unlike many cards of the city issued by rival publishers, is pin sharp. The card was probably issued just before the First World War, but whether it was one of a series has not been determined. Moore's name and address is printed on the back of the card. A series of real photographic cards of Goodwood House and its grounds (including the Pheasantry) have black and white photographs, white borders and machine printed captions. Again, Moore's name and address appears on the back.The Rapid Photo Printing Co. Ltd. of East London produced cards of rather similar design, and it is possible that Moore commissioned them to print his Goodwood cards for him. A 1912 postmark has been noted. Similar cards were produced of other country houses. 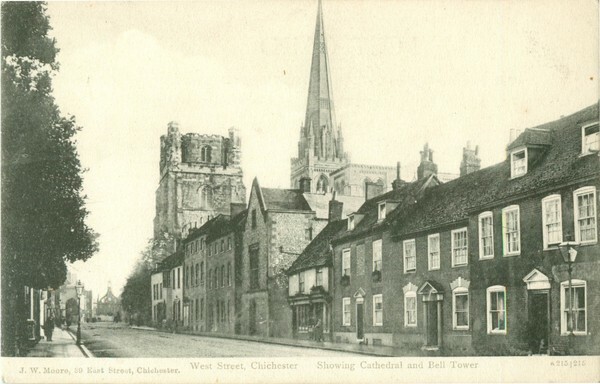 After the business became Moore and Wingham, new cards appeared with facsimile pencil sketches of local scenes and buildings, such as Chichester Cathedral (at least a dozen interior annd exterior views), County Hall and Market Cross. The artist was a George Fossick. A romantic painting by Ewart Baker of the Cathedral and Bishop's Palace seen in moonlight was issued as a coloured collotype. Baker worked for Barton, Harvey & Son of Bristol, who probably printed the card for Moore and Wingham.